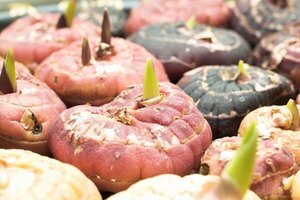 An oddly shaped, dark-skinned tuber with a purple interior that turns blue when it's cooked, a blue potato may look like a food from another planet, but the spuds originated in South America thousands of years ago. They remain a main staple there, but now, many varieties of blue potatoes are grown all over the world. You can find them in the produce section of most markets. 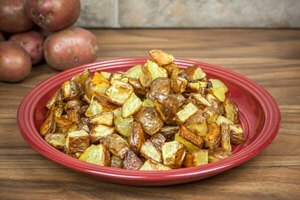 Energy-rich potatoes are low in fat and packed with vitamins and minerals such as potassium and iron. They also contain fiber that helps regulate your digestive system. Blue potatoes also contain health-promoting antioxidants called anthocyanins, which help reduce the risk of cancer, cardiovascular disease and strokes by protecting cells from damage-causing free radicals. 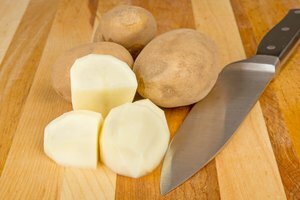 As a medium-starch potato, blues are a good all-around spud that hold their shape during cooking. 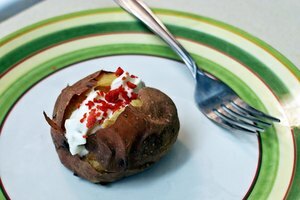 The skin is thin, so you don't need to peel the potatoes before or after cooking. Because they have a soft, moist texture, blue potatoes are best baked, boiled, roasted or sauteed. 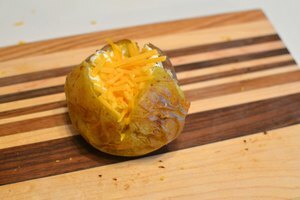 They are not as good as higher starch potatoes for making fries. To make fries or crisps, bake them on a bed of salt, which will absorb some of the moisture. It's rare to see large blue or purple potatoes, not because they don't exist, but because nearly all varieties are harvested young. The many different types of blue potatoes include: Adirondack blue, fingerling, petite, blue vitelotte, purple Peruvian, Congo, all blue and Russian blue. Some of these, such as fingerling, come in many different colors, not just blue. Both heirloom and heritage blue potatoes are grown year-round, but fall is usually the best season to find them. When cooking blue potatoes, consider their bright color; take advantage of it and serve them with other brightly colored foods. The earthy, nutty, mild flavor and the low sugar content of blues make them pair well with herbs, garlic, pork, poultry and mild cheeses. Roast them with salt, butter and herbs for a side dish. You can also puree or mash them or make a hearty blue soup. 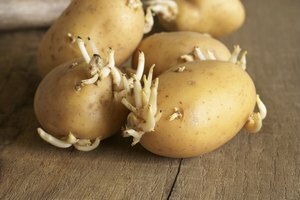 Is It Safe to Eat Potatoes That Have Sprouts?